What happened on the streets of Dublin this Easter was 10 years in the making. Between 1971 and 2006, there was little or nothing said about the Rising and it seemed the period around 1916 was a time forgotten. It was at a Fianna Fáil Ard Fheis that then-Taoiseach Bertie Ahern controversially announced the reintroduction of a military parade past the GPO. "Our Defence Forces - the only legitimate army of the Irish people - will parade to commemorate this historic event and their proud contribution in the service of the State," he told delegates. "The Irish people need to reclaim the spirit of 1916, which is not the property of those who have abused and debased the title of republicanism." He told party members: "I want next Easter to be an expression of our pride as a nation. This is our State's inheritance." And he announced the government would establish a 1916 Centenary Committee to plan for a major celebration in 2016. It went down to rapturous applause in the room where he made the speech but outside it was widely interpreted as a political stunt. Fine Gael said it was an attempt by Fianna Fáil to hijack the Rising and position itself in relation to Sinn Féin. They argued that the current generation had moved beyond the idea of the Rising and associated being Irish with success in music, business and sport. Sinn Féin said the Government needed to mark the anniversary by demanding Irish reunification. Ninetieth anniversaries tend not to be the stuff of officialdom but Ahern certainly stirred up a national debate which turned out to be timely. Whatever his motives at the time, he had one of the best seats on the viewing stand outside the GPO yesterday as the troops marched past in their thousands. 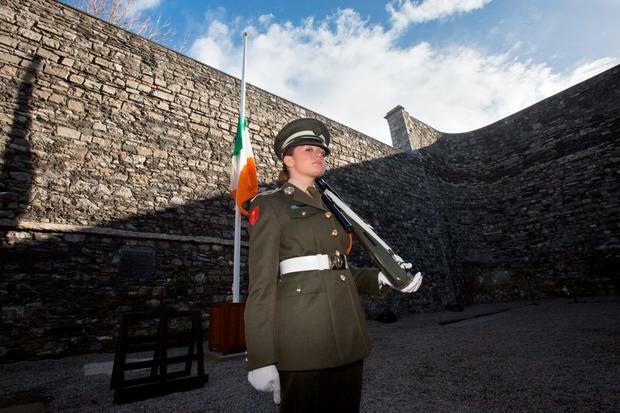 An acting Taoiseach and Defence Minister from the Fine Gael party took centre stage and a poetic President Michael D Higgins led the commemorations. The British Ambassador Dominick Chilcott was present but there was nobody from the British royal family, as had been suggested at one point. And there in the front row was Sinn Féin's First Minister of Northern Ireland Martin McGuinness applauding the Defence Forces as he sat, albeit awkwardly, comparing iPhone photographs of the Air Corps flypast with acting Tánaiste Joan Burton. Former Presidents Mary Robinson and Mary McAleese, both wearing green for the occasion, sat to his right, and then came the current leader of Fianna Fáil Micheál Martin. Notably absent from the stand, though, was Sinn Féin leader Gerry Adams and former Fine Gael Taoiseach John Bruton. For his part, Mr Ahern was beside Colum Eastwood, the new leader of Northern Ireland's SDLP party. If, as I'm sure he would claim, this was what Mr Ahern had in mind when he stood up at his party conference in Killarney a decade ago, then we have not given him enough credit for his vision. The Rising was always going to be a difficult occasion to mark without causing new conflict but somehow over the past few years, it has slowly become a mainstream event. The sight of families, young and old, Fianna Fáil and Fine Gael, lining the pavements on an Easter Sunday to commemorate a bloody battle and a series of executions showed how far we have come. Prior to the election, significance had been placed on who would be Taoiseach when the anniversary arrived but in truth it made little difference. The acting Taoiseach Enda Kenny accepted the military honours bestowed but really he accepted it on behalf of the office of Taoiseach. Mr Kenny played the role but he was just a custodian of the position, at the discretion of the Irishmen and Irishwomen who exercised their democratic right to vote. The backdrop to all of this is a hung Dáil made up primarily of Fine Gael, Fianna Fáil and Sinn Féin. They still won't work together politically but socially the country is moving on. Of course, while the decade of parades helped cleanse the reputation of the 1916 rebels on home soil, another event five years ago helped the world understand what this small island went through under British rule. During her official State visit in 2011, Queen Elizabeth II didn't overtly apologise for imperialism or the events of 1916 but many believe she went further than her subjects would have expected. At a banquet in Dublin Castle, which was until 1922 the seat of the UK government's administration in Ireland, she offered her "sincere thoughts and deep sympathy" to the victims of Ireland and the UK's troubled past. "With the benefit of historical hindsight, we can all see things which we would wish had been done differently or not at all," she said. Yet after all the decades of bickering and bloodshed, it would have been difficult to find anybody on the streets of Dublin yesterday to condemn the Rising. But neither was there any great sense that Irish people want a forced apology for the executions of the men who became martyrs. That might come in time but given that we are only learning to fully share the outcome of our own complicated history, it is probably too much to expect from our former imperialists right now. As a result of the centenary, people on all sides of the political divide here are talking about 1916 in a more balanced way than ever before - and in schools children are learning about a Proclamation that Barack Obama described as "a daring document" and "a vision statement" that compels us to continually look forward. We live in a time when we are proud to be separate from Britain while simultaneously their closest ally on many European and international issues. Perhaps in years to come, their schools will teach children the story of the Rising too and wouldn't that acceptance of our shared history be better than any apology. We have our independence. There is peace in Northern Ireland and a roadmap for a better future.